Review by AllTheBestFights.com: 2016-02-19, fight not particularly good between Kimbo Slice and Dada 5000 Harris: it gets two stars. Kevin ‘Kimbo Slice’ Ferguson entered this fight with a professional mma record of 5-2-0 (80% finishing rate) while his opponent, Dhafir ‘Dada 5000’ Harris, has an official record of 2-0-0 (2 knockouts). Kimbo suffered his last loss in 2010 when he faced Matt Mitrione but since then he has fought and won just once, against Ken Shamrock last year (=Kimbo vs Shamrock), while Dada 5000’s last fight occurred in 2011 when he defeated Tim Papp. 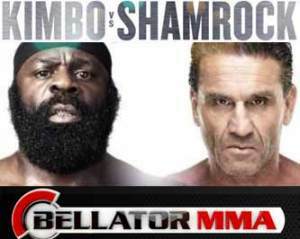 Kimbo vs Dada 5000 is on the undercard of Ken Shamrock vs Royce Gracie 3 – Bellator 149. Watch the video and rate this fight! 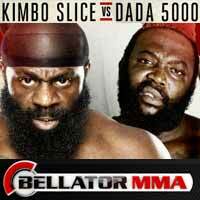 Review: 2012-10-06, this is not a professional boxing fight: Kimbo Slice vs Howard Jones gets one star. Kevin ‘Kimbo Slice’ Ferguson entered the fight with a record of 5-0-0 while his opponent should be Howard Jones with a record of 5-4-0 but other websites say he is Canny McCann (but there is none professional boxer with this name?!). Kimbo Slice vs Jones is the main event of the evening but if it is true Kimbo Slice will face Roy Jones Jr he needs better opponents… Watch the video! Review: 2012-05-12, even with the knockout in the first round the fight of Kevin “Kimbo Slice” Ferguson and Jesse Porter isn’t worth our three stars. Kevin Ferguson entered the fight with a record of 4-0-0 while Jesse Porter had a record of 3-4-0 (on the original fight card Kimbo Slice was expected to face Richard Dawson). Watch the video! Review: 2012-03-24, three stars for Kevin “Kimbo Slice” Ferguson vs Brian Green, fight ended by KO in the fourth round. Kevin “Kimbo Slice” Ferguson entered the fight with a boxing record of 3-0-0. On the original fight card Kimbo Slice was expected to face Mike Glenn. Watch the video! Review: 2011-12-30, low-level fight between Kevin “Kimbo Slice” Ferguson and Charles Hackmann: one star (fight ended by unanimous decision). This match is the Kevin Ferguson’s third professional boxing fight (2-0-0). Watch the video! Review: 2011-10-15, Kevin Ferguson, best known as Kimbo Slice, won the fight against Tay Bledsoe in the first round with an impressive KO! 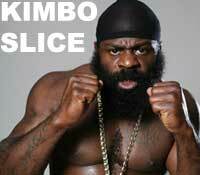 Kimbo Slice’s second professional boxing fight. Watch the video! Review: 2011-08-13, nice ko of Kevin Ferguson, better known as “Kimbo Slice”, but the fight lasts just 17 seconds: 2 stars. Kevin “Kimbo Slice” Ferguson defeated James Wade by KO in the first round (Kimbo Slice’s professional boxing debut). Watch the video!